This has been a super busy and stressful week and a bit. My introverted self has been pushed to its limits, my insecurities have been tested, but I know it’s all good for me. Sunday the 10th: first day of tryouts for the VGVA indoor league. I’m shooting for the Competitive division, as I have for the past several years. Actually made it in 2016, then last year I was pushed down to Intermediate. I mean, I get it, there was an influx of very high-level players that pushed everyone down. It still stings, though. Tryouts were followed by an afternoon of beach volleyball. Part of me wasn’t really keen on it—the part that likes to just sit around playing video games—but hey, sun and exercise and hot shirtless guys? Can’t say no to that, even though it depleted my energy cells. Monday, I should have gone to that vball skills clinic, but (a) I was exhausted, and (b) I was giving a presentation at a WordPress meetup, and meeting a friend to rehearse with. I was nervous, not to say terrified, but the rehearsal hammered through all the bugs. I knew my material was solid, and now my presentation was too. Others agreed the next day. The story really started in February when I went through an all-day workshop specifically for people who’d never presented in WP meetups / WordCamps, but wanted to dive in. We came up with ideas, refined and polished them, then did a super-short presentation. So that was good. And then at the WP15 party a couple weeks ago, the meetup organiser asked me if I wanted to do this presentation for real. Though part of me panicked I said yes, and here we are. This is a huge milestone for me! I kind of expected to feel more changed, but I knew that was silly. A single act won’t remove all my fears and insecurities. But I’m chipping away at them. This isn’t the end of the story. Also on Tuesday, not pictured: my semiannual checkin / review at work. It went fine! No worries there. Okay, that’s a lie, I was worried. Isn’t Imposter Syndrome tons of fun? Though it’s nice that I can tell the difference between that and rational worry. Most of the time. Also on Tuesday, pictured: some interesting theories about God. 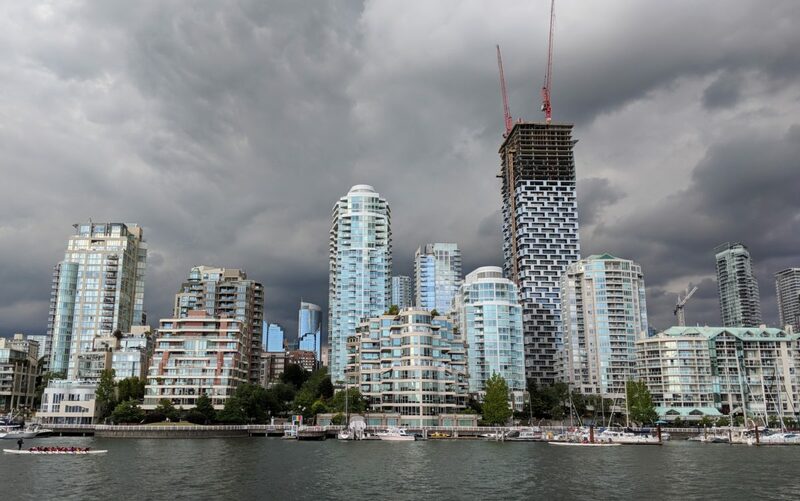 Wednesday, a dramatic shot of light reflected by and on downtown buildings, followed by an even more dramatic shot of Yaletown with angry-looking clouds in the background. No storm was actually coming, but… Thursday happened to be the first of three nights in a row volunteering for the VMC. I figured that mentally it would be freaking exhausting, especially after all the drama that week, and Taichi on Saturday and going to the OneCity nomination meeting followed by more tryouts and more beach on Sunday and back on the vball skills clinic on Monday and Jesus when would I get the chance to rest and grab some “me” time? It all seemed incredibly overwhelming, but I decided to just put my head down, wear a big smile and power through it. It felt like another test, another workout, and I would pass it like I’d passed those other ones. What I found out is that it wasn’t as hard as I thought. Maybe I found some energy reserves I didn’t know I had, maybe I’d been fighting myself and expecting to have a hard time. Or maybe a little bit of both. I do know the volunteer pizza party on closing night helped a lot, followed by a quiet bit of wandering around Granville Island and shooting the mainland. Haven’t done night photography in a while, and people still can’t believe that photo was taken by a phone. Second tryouts went well. It took me a little while to find my groove, but in the end I was playing (I feel) better than last week, with better hits and especially better blocks. So on average… who knows? I guess we’ll see. And so the Very Dramatic Week ended. Now it’s all over but the pretty pics: a bit of beach vball, the #underbrella public art piece behind Yaletown-Roundhouse Station, taken on the way to the skills clinic, and a lucky shot of a seagull soaring in front of a shiny Coal Harbour building. Didn’t even see it there when I took the picture, but there you go. And I’ll remember this: next time concentrated drama happens in my life, hopefully I won’t build it up too much in my head, because I know I can handle it. And maybe that’s the test right there. It’s funny how memory works. What sticks in my mind about these five days is the grey overcast sky, as it was last Tuesday. I took this photo on the way to the Y, and kind of felt conflicted about it. On the one hand, I like the perspective-y composition that a lot of my fans also seem to like. On the other hand, it’s grey, grey sky on grey street and even the brown hospital building and orange traffic thingies aren’t helping. I’ve felt this before: whenever the weather gets bad, I retreat. I don’t get out so much, I don’t look around so much, I don’t get inspired so much. That’s normal, right? But it does mean I have to work harder at it. And the thing is, though the weather’s been kind of iffy, overall it’s been pretty good. There are some clouds, but they just make those sunsets all the prettier! 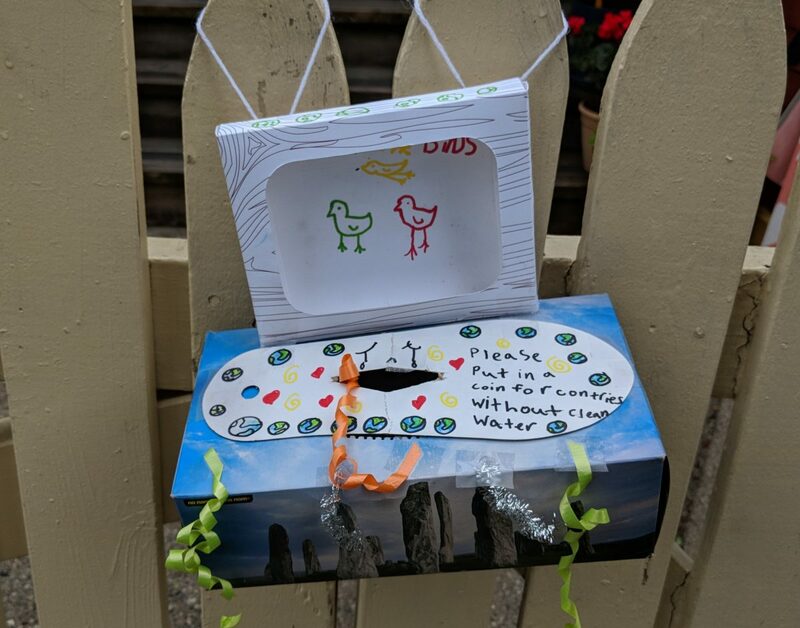 Though not as pretty as this donation box, which some Mole Hill children put up. Where is the money going to exactly? Which country will benefit? Should I be worried they’re just leaving change for people to grab? Nah. I’m happy encouraging the youth of today to do good in the world. Saturday was my first of four nights volunteering for the Vancouver Men’s Chorus summer show. I’ll have more this weekend. Only planned 3, but they were short-handed, so I squeezed in one more. Though don’t get me wrong, it’s not a chore at all! The VMC always puts on amazing shows… and this one was different. “Gays of our Lives” could mean anything, but this was a bit more conceptual and nerdy. They wove meditations on queer history, community and gender into show-stopping song and dance numbers, and I am super looking forward to seeing it again and again and again, picking out details and nuances I missed the first time. There I was, resting outside the Roundhouse after a grueling volleyball skills clinic, when I spied a bee crawling on the ground. I used to be pretty scared of those stinging critters—only natural, right?—but I wasn’t scared at all. Mostly because I figured it was a worker honeybee that had just reached its expiration date. They only live for a few weeks, y’know. Turns out it was a bumblebee. 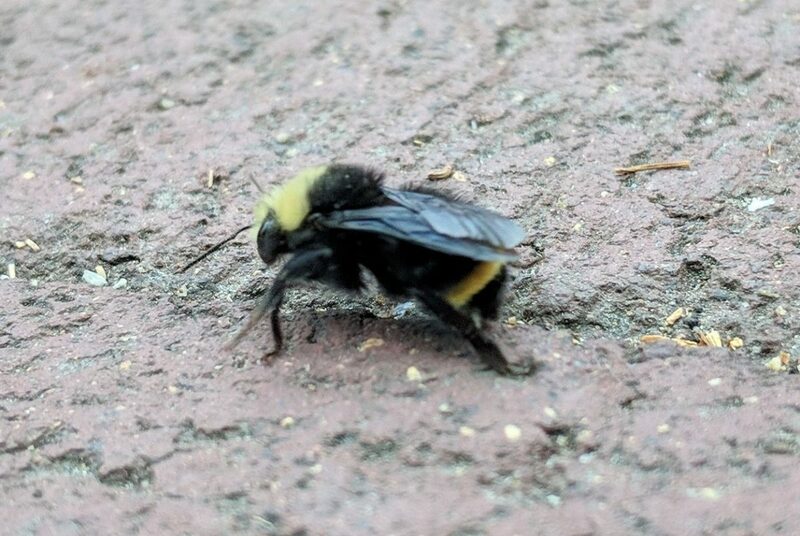 I didn’t peg it as such because (a) I’d never seen a bumblebee crawling on the ground, and (b) it was a lot smaller and slimmer than any other I’d seen. But apparently this is one of the first generation born in the spring; later in the summer we’d see big stocky ones like I was used to. Amazing. Live and learn! Then on the way home, I snapped one more shot, of the sunset burning up the clouds over Davie Street. My god that’s gorgeous. I think I might include it in my 2018 retrospective. Speaking of clouds though, the weather’s gotten more and more overcast over the last week or so. Right now I’m not enjoying it because everything’s grey and icky, but for a while, it meant a beautiful mix of clouds and blue sky. And one more, Yaletown towers holding up a delicate canopy of clouds. And then the canopy got not so delicate… It actually rained a little bit that day, though the weather did clear up later. Mind you, this was pretty good beach vball weather. Much more sun than that and the sand gets really hot. Downside: not so many hot guys taking their shirts off. And, oh yeah: it’s Pride Month! A bit less meaningful in BC, since our Pride thing is in August, but still. I’ve had my eye on the Heart of Davie Village piece for a while, but was never quite happy with either the light or the angle. But there we go. Glad to live in this queer-friendly neighbourhood, in this queer-friendly city.